Linda is back and she was kind enough to write up a recent trip report. 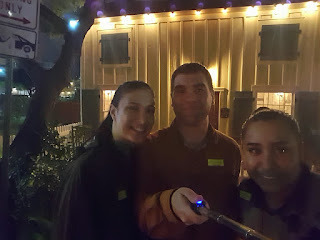 We went on a downtown Austin ghost tour. So stick around and keep reading for a great post. Halloween is the perfect day of the year to have a birthday. It means I can always make sure Jarrett partakes in Halloween festivitiesJ. For example, I love ghost stories and ghost tours. Jarrett, on the other hand, does not even want to consider the idea of ghosts. So, on any other night, Jarrett would have refused to go on a ghost tour with me, but since it was my birthday, he could not refuse. Jarrett and I are also history buffs, and we just moved back to Austin, so when I found out about the Haunted Historic District Walking Tour, I knew we were taking it on Halloween. 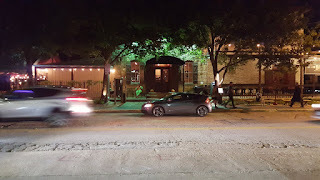 The tour begins at the Moonshine Patio Bar and Grill at 8:00 p.m. Jarrett and I knew we would be having drinks that night, so we took the Austin Metro. It stops just a block from The Moonshine, and on Halloween it provides rides later than usual, so it was an excellent means of safe transportation for us. Also, who doesn’t like trains? We love them, and we thoroughly enjoyed our ride through the city of Austin. When we arrived at The Moonshine, we were already short on time. We sat at the bar area, and explained to our waiter that we were hungry and needed some food and drinks pronto. He recommended one of the sandwiches. We shared a Turkey Press. I ordered a Silvermoon Margarita and Jarrett ordered a Blind Mule. The food was delicious, and our waiter was expeditious. Even our friends Yanine and David, who arrived fifteen minutes before the tour, were able to get their drinks before we headed on the Haunted Historic District Tour. The tour was about a mile and took about an hour and a half. Because it was Halloween, there were two large tour groups. Nevertheless, our tour guide was loud enough for all of us to hear Austin’s stories. We learned that The Moonshine is Austin’s oldest building because a flood in the 1800s destroyed all earlier structures. We saw the home of one of the survivors of the Alamo and heard stories involving Christmas trees and angels being thrown to the floor when no one was in the home. 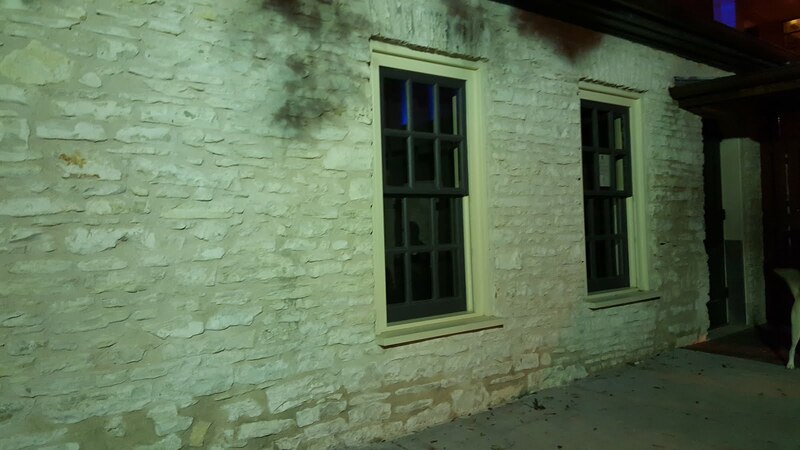 We also learned about one of Austin’s oldest fires and the fireman who haunts a building in downtown Austin, and the story of Texas’s first serial killer. Throughout the tour, the tourists are encouraged to take photographs and check for any possible anomalies. 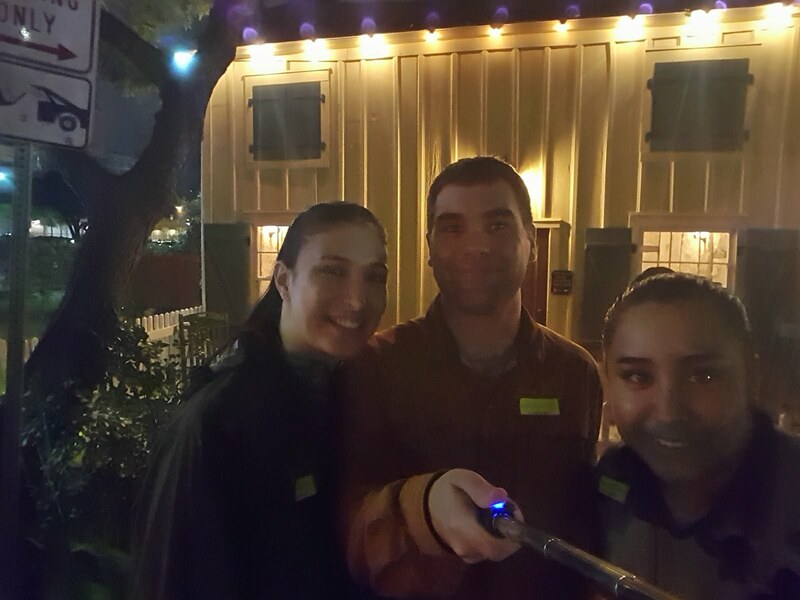 At the end of the tour, the tour guide passes around photographs of any paranormal activity any of tourists caught on camera. They’re also encouraged to share their paranormal encounters with the rest of the group. The stories were entertaining to hear, but the scariest moment occurred when a possibly mentally unstable man joined the group and told a ghost story. It wasn’t his story we minded, because it was pretty great; it was his aggressive attitude that intimidated many in the group. He talked down to the tour guide and interrupted other people. Things could have easily escalated out of control at that point, but our tour guide was knowledgeable and graceful enough to calm the man down and get him to leave. After the tour, the four of us returned to The Moonshine. Jarrett and I had the White Chocolate Bread Pudding, and it was amazing. I had a Hard Lemonade and Jarrett enjoyed an Angel’s Envy Old Fashioned. After an hour-long conversation about irrelevant topics, Jarrett and I headed back home via the metro. It was the end to the greatest birthday I’ve ever had. 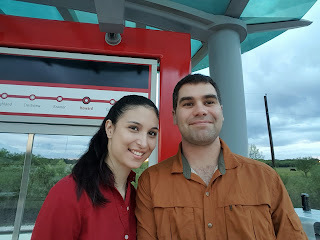 For a night of adventure, Jarrett and I strongly recommend riding Austin’s CapMetro, The Moonshine Patio Bar & Grill, and the Austin Ghost Tours. 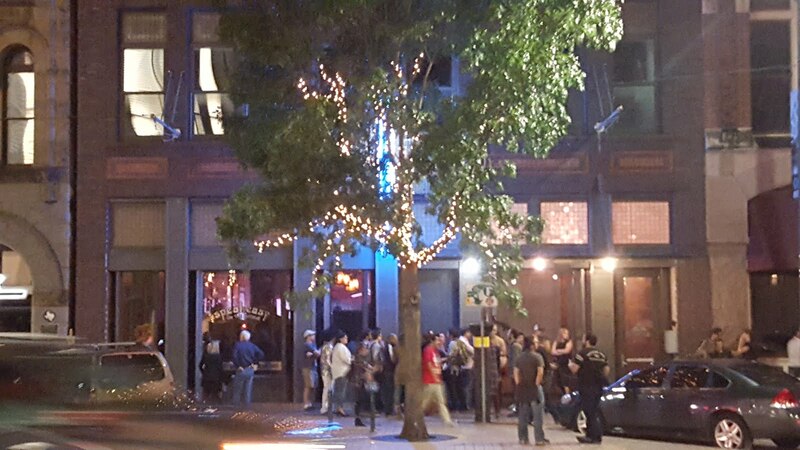 If you’ve been on this ghost tour or any other, let us know your thoughts. Make sure to keep up to date on all our adventures by following us on Facebook.